whose hunger burned like a fire. and with vinegar she doused her pyre. The Creamery in Bunratty: light, crispy, and darn good fries... er, chips. The portion was quite large and could easily feed two as well. The Creamery is a charming pub across the street from Bunratty Castle in Co. Clare. The Cellar Bar in Dublin (pictured): gorgeous fish lightly battered in tempura batter, fantastic chips, and all served with the most delicious minted peas in the world. 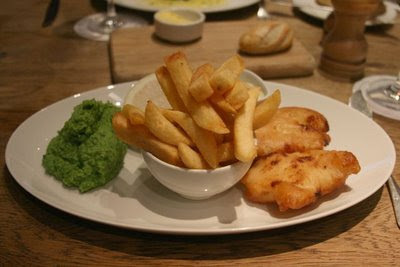 The chef is not keen on being known for his fish and chips, but I say, "Own it!" You'll find the Cellar Bar in the basement of The Merrion Hotel in the heart of Dublin. Welcome to all of you who are joining us from WanderFood Wednesdays! Where in the world have you eaten fantastic fish and chips? And do you also write limericks? Yum! Well, yum except for those peas. Blech. Oh, yum! Good fish & chips is hard to find in Montana. I'm going to California next month and one of the first places I want to go is Andria's -- a fish place by the harbor of Oxnard. They have the best deep fried halibut. I haven't had it in 3 years, so I'm getting pretty antsy. I literally drown my fish & chips in malt vinegar. Thanks, Angela -- now I'm hungry! Off topic: I found ur blog link from the sharethis forum. it seems u reported a multiple buttons problem. Now it seems to be resolved. How did u fix this? Cheezo, I don't know how it was fixed. I installed a new template, added the ShareThis code, and the problem disappeared. There must have been something in the old template that made it happen. A mystery!